Hero's new sale and marketing chief, Ashok Bhasin, revealed in his presentation where the Duet fits into Hero's scooter plan. 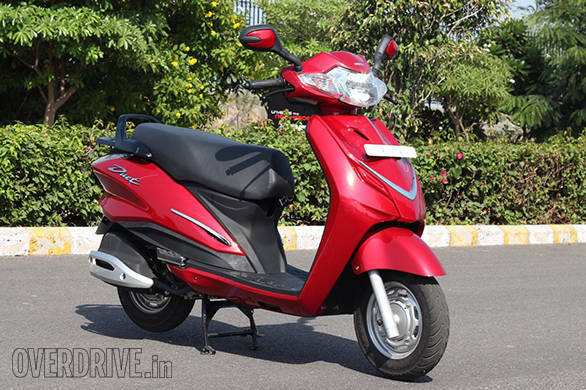 It is set to slot in to the multi-purpose space between the Maestro, the men's scooter and the Pleasure, which is for the girls. In that sense, it is supposed to be the family scooter. Given how traditional that position is in India, Hero have chosen for the Duet a metal body that adds 6kg of weight over the lighter Maestro Edge. The panels are kept simple with the only design flourish being a fairly complex set of curves in the side body where the painted bits meet the tail lamp. Hero officials told us that their feedback suggests that the minimal chrome strips, a vee on the front apron and two dashes on the side will be well liked by the target customer. These customers apparently want a dash of style but not too much. 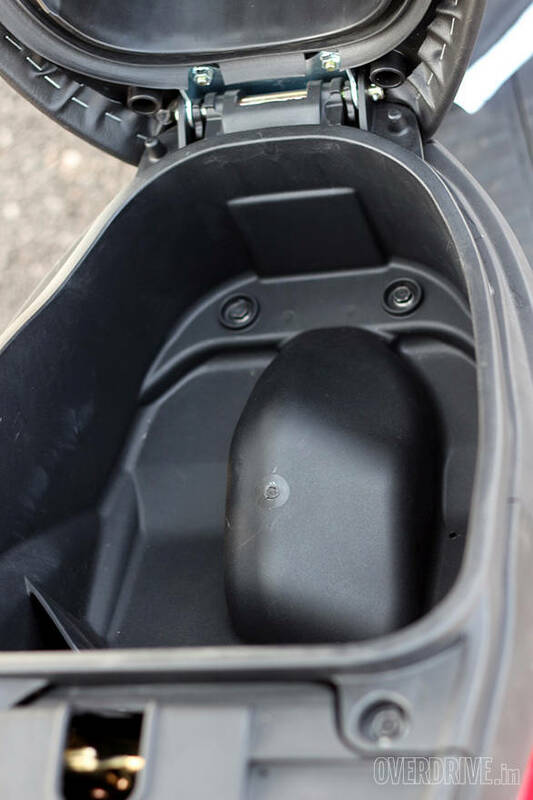 The rear of the scooter has a well-done grab rail that extends into a short luggage rack complete with bungee points and this gets a 10kg load rating too. Under the skin is, according to the company, a whole new platform. That's a new frame, new engine and obviously, the new design. The details on the engine and frame were brief, but we know the steering geometry has been altered. The engine, an air-cooled 110.9cc SOHC single, produces 8.4PS at 8,000rpm. Peak torque is 8.3Nm at 6,500rpm. The transmission is, obviously, variomatic. 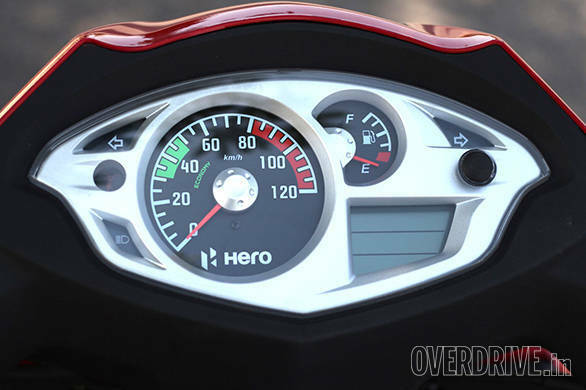 Hero didn't offer any performance claims - I saw 84kmph (indicated) on the Duet's dials. However, it claims to return 63.8kmpl. 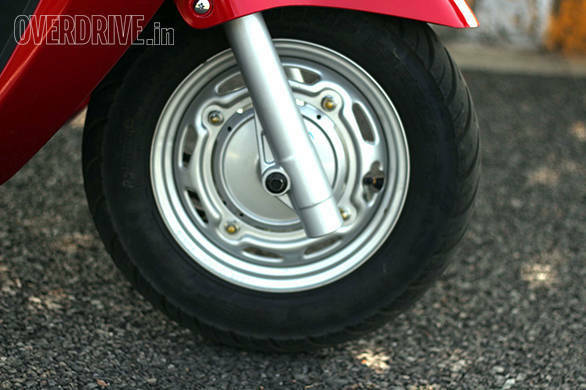 Hero has also added to the Duet its Integrated Braking System (IBS) that links the rear brakes to the fronts to offer new riders a better braking experience. Riding on a dusty stretch, the Duet was able to stop pretty hard without drama. What really impressed, and you'll see this in the Maestro Edge story as well, is the suspensions setup. As expected, the Duet feels in its element on good roads. But I subjected it to potholes as well as jumped off speed breakers - yeah, not its expected role to be sure - but the front telescopic forks shrugged off the landings while both ends absorbed potholes really well. Even better, the scooter managed this without resorting to a heavily damped setup. Which means Duet corners quite hard - another surprise. There's a sense of extra weight that works in its favour - it sort of cancels out the usual top-heaviness of a scooter. But as with all scooters, you really should try tipping them hard into a corner, all of them, Duet included, show such eagerness and tenacity. What Hero adds on top are a comprehensive set of features. The Duet had a small light for the under tray as well as a USB out to charge devices. The Hero presentation mentions that it's a USB 3.0 slot which suggests it offers a faster charge rate. 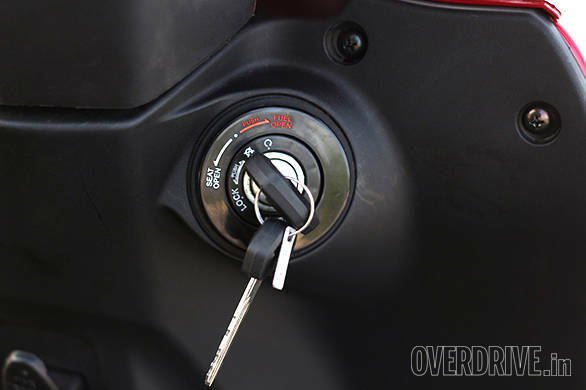 Hero has also employed a single key slot which not only controls ignition and steering locking but also opens the seat and releases the fuel cap which is mounted behind the rear seat under the grab rail. 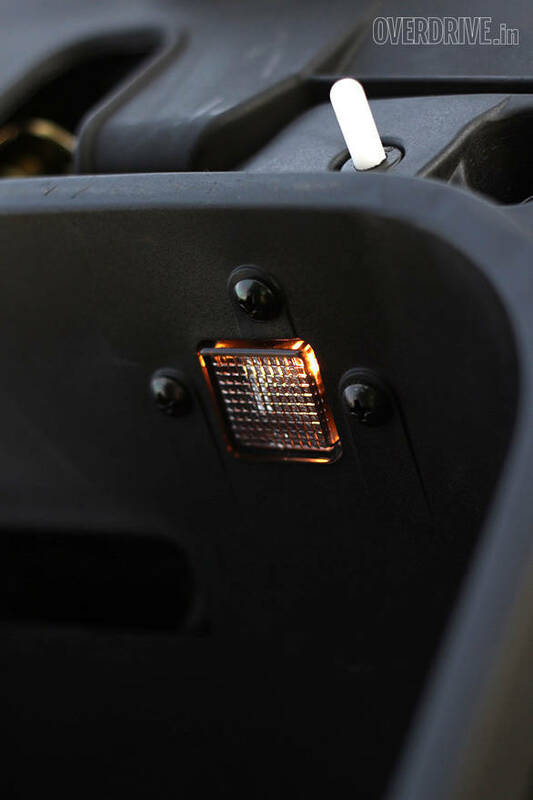 The Duet also gets daytime lamps, two bag hooks, a pass switch, side stand indicator (which indicates but doesn't cut out the engine) and a service due indicator. The questions that remain are the launch price and timing. 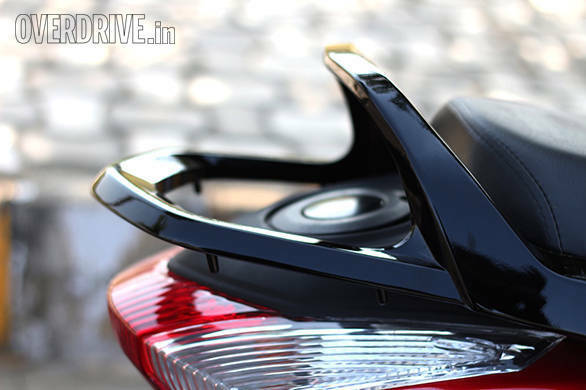 Hero only noted that the Duet will follow the Maestro Edge to market. It's reasonable to assume the price will be below the Edge since the latter is the current scooter flagship. What I went in hoping for was a scooter that's at least as good as the better scooters in the segment. It's a critical question since the Duet and the Maestro Edge are the first self-proclaimed all-indigenous Heros. The updates the company rolled out in the form of the Karizma and the Xtreme Sports have both not been received as well as Hero would have liked. I'm happy to say that the Duet meets my expectations. Our ride was short and the inevitable comparison test will be long, but I'm pretty confident that the Duet will beat more than a few scooters before the dust settles. And so begins Hero R&D's journey with a crisp product launch that eschewed the usual parading of celebrity endorsers, song and dance or both. A launch where product development people were on stage more than sales and marketing. A new Hero is emerging and we can't wait to see where their journey takes them. 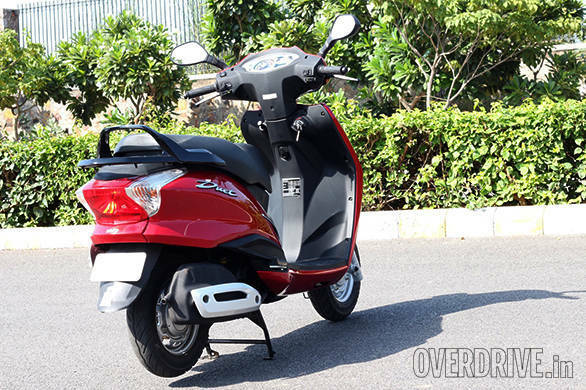 Update: Hero has announced the prices of the Duet scooter today (October 28, 2015). The Hero Duet LX is priced at Rs 48,400 while the VX retails for Rs 49,900, ex-Bangalore. The scooter is currently available only in some states of South India.